If you are like me, you stock up on meats when they are on sale. This week, it was the proverbial boneless, skinless chicken breast. For those of you who have been reading my blog for a while will know that I more often than not buy bone-in chicken and then debone as needed. Since I have a large volume of chicken on hand, I am challenged to make more than just the typical chicken sandwich for dinner. My inspiration for this recipe come from a few sources. One, a chicken dish I often get at a large, chain restaurant, but their version is covered in bacon and cheese. Second, onion tangles made on this week's episode of "The Pioneer Woman," one of my favorite cooking shows and my inspiration for beginning to blog. By combining parts of both of these inspiration, this recipe was born. If you really want to take this recipe to the next level, you could fully combine the two by adding bacon and cheddar to the chicken, however, I really do not think it is necessary. A note of warning, you may want to double the Cowboy Onions for the recipe. My husband and I found ourselves eating them up like an appetizer before they even made it to the plate. Let's just say that they are reminiscent of a flowering onion some people might enjoy. 1. Place the thinly sliced onion rings in a shallow dish and cover with buttermilk. Set aside. 2. Cut the chicken breasts in half lengthwise to create a total of 4 chicken breast portions. This will assist the meat in cooking more evenly, and, let's be honest, most chicken breasts are too big for one serving. 3. In a small dish, combine the dry seasoning mix for the chicken. Sprinkle half of the seasoning over the first side of the chicken. 4. Heat a grill pan over medium heat. When hot, place the chicken in the pan, seasoned side down. Sprinkle the remaining seasoning over the top of the chicken. Grill for 7 minutes or until golden on the first side. Flip the chicken and cook for another 7 minutes or until cooked through. I like to place a few tablespoons of water onto the pan and cover with a lid for the last few minutes to steam the meat throughout. I have found this helps the meat to remain moist and any drippings on the bottom are released and brown the meat. 5. While the chicken cooks, heat a quarter-inch of oil in a large skillet over medium-high heat for 5 minutes. As the oil heats, combine the flour and seasonings in a shallow dish. 6. You will now begin frying the onions in batches. Gather some of the onions out of the buttermilk and dredge in the seasoned flour. When the rings are covered, gently shake them to remove excess flour and place in the preheated oil. You will need to keep an eye on the pan. If they are cooking too fast, reduce the heat to medium. The onions will fry in approximately 3 batches. Each batch should take 2-3 minutes. Remove when golden and place on a paper towel lined plate to drain. 7. When the chicken is cooked, top with the cowboy onions and serve with your choice of sides. Although you might find this hard to believe, candy does not get eaten in my house. We constantly have a stash of leftover chocolate bars from the holidays. A great way to use up the wonderful chocolate bars is to bake with them! I have made everything from chocolate crossants to ganache with my leftover candy. Today I wanted something small and SINFUL! The result is an airy cookie with a molten center. 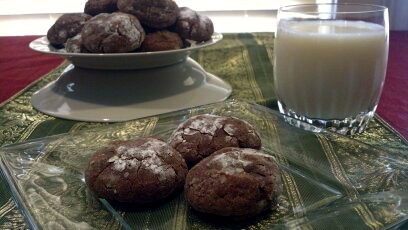 These cookies would be perfect for a romantic dessert on Valentine's Day. 1. In a stand mixer, beat the margarine, sugar, and brown sugar until creamy. This should take about 3 minutes. You want them to incorporate well. 2. While the sugar is mixing, combine the flour, cocoa, baking powder and salt in a separate bowl. 3. Add the egg to the margarine and sugar mixture. Combine well. Make sure to scrape down the sides of the bowl. 4. Slowly mix the flour mixture into the wet, making sure to thoroughly combine before the next addition. 5. On a chopping board, carefully chop your choice of chocolate. I used a Belgian dark chocolate bar with almonds. You can use any high quality chocolate of your choice. 6. Stir the chocolate chunks into into the batter. This will take some muscle! 7. Arrange an assembly line with your batter then a bowl with powdered sugar and then an ungreased cookie sheet. Pinch off the dough and using your hands, roll into 1.5" diameter balls. Roll the chocolate balls into the powdered sugar and then roll again in your hand to dust off excess. Place on your cookie sheet, allowing room around each cookie. 8. Bake in a preheated 350 degree oven for 10 minutes. 9. Remove from the oven and allow to cool for 3-4 minutes before removing. When you are stuck at home, snowed in by an approaching storm and fighting sickness, there is nothing more soothing than a big bowl of steaming soup. I am not a fan of chicken noodle soup so this is not your typical chicken soup. 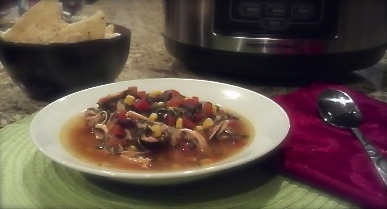 This soup combines chicken with fresh vegetables and a little kick from some cayenne pepper. Any leftover soup can also be frozen in a freezer container for another day. Feel free to spice it up with peppers and toppings of your choice. I kept mine simple with just a few crushed tortilla chips but I could see adding some sour cream and cheese to make it a quesadilla in a bowl. This was just what the doctor ordered! Place all ingredients in a crock pot. Cook on high for 4-5 hours or 7-8 hours on low. Check the seasoning before serving. Based on the seasoning in your chicken broth, you may need to add more salt and pepper seasoning (I had to add 1/2 teaspoon more salt because I was using homemade stock). If you add additional seasoning, allow to simmer for another 20 minutes. Right before serving, use 2 forks to shred the chicken. Stir and serve! 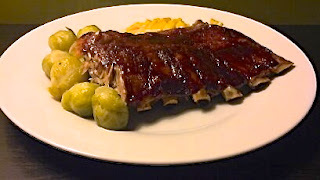 During the summer months, my husband loves to use the charcoal grill and smoker to create wonderfully tender ribs. I have tried several methods indoors but have been somewhat disappointed every time. 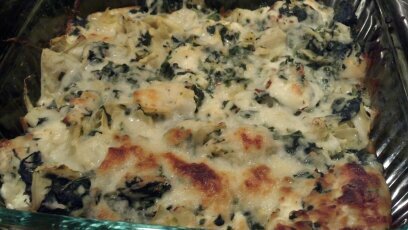 After throwing this recipe together, I realized what I had been doing wrong; I was trying too hard! To get tender ribs, you really just need steam, low heat, and time. These ribs were perfect! This recipe only serves 2, but can easily be scaled up for more servings. 1. In a small bowl, combine your dry seasonings. 2. Place a wire rack over a baking sheet. 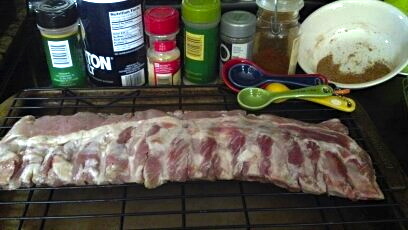 Lay your ribs on the wire rack and thoroughly coat both sides with your dry rub. Make sure you cook the meat bone side down. 3. Place the pan in the oven and carefully add the 3/4 cup water to the pan. Cover tightly with foil. Once the ribs are in the oven, you are just going to leave them alone for 3 hours. The water in the pan will allow the ribs to steam and the wire rack allows them to cook evenly throughout. 4. After 3 hours, carefully remove the foil and spread 3 Tablespoons of your favorite sauce (I recommend a Memphis style) over the top of the ribs. Cook uncovered for 30-40 minutes until the sauce is dried and formed a nice crust. When I was in high school, I was fortunate enough to be able to travel with my mother to Hawaii on two different occasions. While there are so many memories from those adventures, I very vividly remember the sweet tea. The first time the large glass came out with a large spear of pineapple inside, I was hooked! You may think this is an odd item to commit to memory, but for a Southern girl, it was the first time I had ever seen ordinary tea sweetened with anything other than sugar. Now that I am older, I actually do not even like sweet tea....I know, I know, that is punishable by death in the South. However, I do love teas flavored with fruit. Tonight, as I was slicing a fresh pineapple, I decided there was no reason to waste the core and Hawaii came to mind. This tea is light, slightly sweet, and a perfect way to recycle a typically wasted pineapple core. 1. Heat 4 cups water for 2 minutes on high in a large, microwave safe container. 2. Add 6 tea bags to the hot water and allow to steep on the counter for 10 minutes. 3. Place the core spears into a large pitcher or decanter. Pour the steeped tea into the pitcher while holding the bags behind. 4. Add 4 cups cold water to the tea bags and squeeze to remove any additional steeped tea. Pour into pitcher. 5. Fill the pitcher with the remaining cold water until full. Stir. 6. Chill in the refrigerator for at least 1 hour. 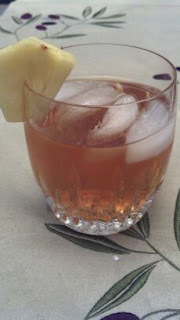 Note: If you want a truly sweet tea, replace 1/2 cup water with 1/2 cup pineapple juice. 7. Serve over ice with a wedge of pineapple for garnish. The past Friday night, I was struggling with what to fix for supper. I hadn't been to the grocery store yet and really needed something to use up some center cut pork chops. 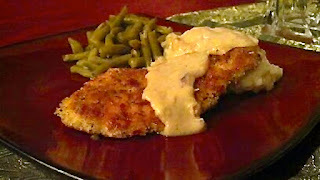 I did not want the typical pork dinner and my husband happened to mention he had seen a recipe in the current "Southern Living Magazine" for fried pork chops (p.110). I did not have all of the ingredients on hand, so I adapted it to what I had and to our taste. The result was crisp and delicious. Next time, for my husband's sake, I will leave the onions out of the gravy and just make the pan gravy in the pork chop drippings. Either way you do it, this was great! This is great for a budget friendly family dinner or an elegant dinner party. Preheat oven to 400 degrees. In a 12 inch diameter cast iron skillet, spread the all purpose flour into an even layer. Toast in the oven for 28 minutes, stirring every 7 minutes. During the last 7 minute segment, keep a close eye; you want the flour to be light brown (tan) but not burn. Remove from the oven and spoon into a bowl to cool. *Note: To store the remaining browned flour, store in an air tight container (I used a zip top bag) in the refrigerator for up to 2 weeks. This is great for any pan gravy you want to make. Nice toasty flavor without a lot of fat in the pan for browning the rue. 1. Place the sandwich bread slices on a baking pan and place in the 400 degree oven. Allow to toast for approximately 5 minutes and then turn and brown the other side. Remove from the oven and allow to cool. Reduce oven temperature to 200 degrees. 2. While the bread is toasting, place each pork chop between two pieces of plastic wrap and pound to 1/8 inch thickness. I do not own a meat mallet so this is when I break out my rolling pin and get out some aggression! Lay the pork chops on a baking pan and sprinkle with 1 teaspoon salt and 1 teaspoon pepper. Set aside. 3. Using a food processor with blade attachment, grind the toasted bread until flaky crumbs appear. Pour the crumbs into a shallow dish and add the remaining salt and pepper as well as Italian seasoning. Stir to combine. 4. Create an assembly line --- shallow dish #1 with 1/2 cup AP flour, shallow dish #2 with 4 beaten egg whites, shallow dish #3 with bread crumb mixture, and then a baking dish with a wire rack for placing the coated chops on until cooking. Run each flattened and seasoned chop through the dishes making sure to coat well on both sides. You will need to use your hands to press the breadcrumbs to the chops. Allow to sit on the wire rack until ready to cook. 6. When the oil in the pan is hot, place 2 chops in the pan at a time and cook for 3-4 minutes. Brush the top with some of the reserved oil and then flip to cook for another 3 minutes. Remove from the skillet and place on another baking sheet with a wire rack. Place the baking sheet in the oven to keep the pork chops warm. 7. Repeat the process with and 1 1/2 Tablespoons of oil in the pan to cook the remaining 2 pork chops. 8. Keep the cooked chops in the 200 degree oven while preparing the gravy. 1. In a saucepan, combined the oil and onion over medium heat. Allow to brown for 6-8 minutes, stirring occasionally. If you notice the onions cooking too fast, reduce the heat. We are caramelizing the onions, not frying them! 2. Add 1/4 cup browned flour and stir to combine. 3. Slowly whisk in the milk, making sure to stir constantly. 4. Add salt and pepper and stir constantly for 5 minutes. Add more salt and pepper to taste. 5. Serve over pork chops and mashed potatoes. About this time every winter, I find myself craving light, vibrant food reminiscent of the warm days of summer. What better time to cook such a meal than on a snow day?!? I can't think of one. So today I made a quick and simple lunch full of flavor, colors, and textures. This quick and easy meal can easily be made in large quantities, however, this recipe is written to serve two. This is just the taste of summer I needed to pull me from the winter frostbite! And for those of you still working on those New Year's Resolutions (you know who you are), this is full of flavor and vitamins but low on fat; you can even up the fiber content even more by using brown rice (plan to up the cooking time). It's like a Caribbean vacation on your plate! 1. Combine all the ingredients for the chicken, except the oil and chicken, in a small, shallow dish. Using a whisk, slowly add the oil to the lime mixture. Continue to whisk vigorously until combined. 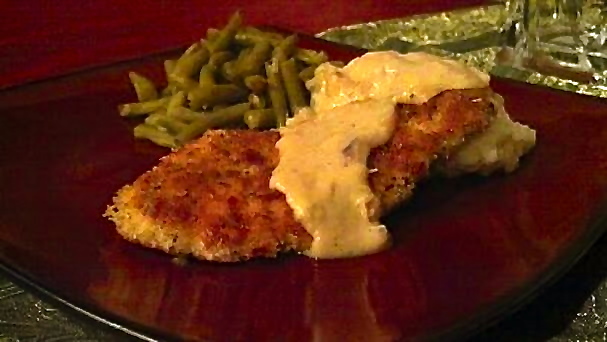 Add the chicken tenders and set aside for 5 minutes at room temperature. NOTE: This is a quick marinade. Because of the acidic juice of the lime, longer marinading will actually begin to cook the meat. 2. While the chicken is marinading, melt the butter in the bottom of a saucepan. Add the chopped yellow onion, salt, and pepper. Allow to cook for 3 minutes, or until the onion begins to become transparent. Add the rice to the pot, stirring to coat in the butter. Cook for 30 seconds. Add the chicken broth to the pot and bring to a simmer. Cover and cook on low for 10 minutes or until the liquid is absorbed. 3. Once the rice is cooking, heat a grill pan over medium heat. When hot, add the chicken tenders to the pan. Allow to cook for 5 minutes on the first side without moving. This will allow for searing of the meat. If you feel the meat is cooking too fast, simply turn the heat down on the grill pan. 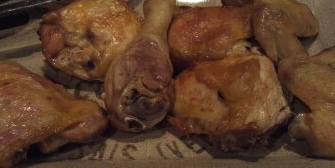 When the chicken appears to be cooked halfway through, turn over and allow to cook another 5 minutes or until cooked through (juices are clear) and golden brown. 4. When the rice is cooked, add the black beans, corn, and tomato. Stir to combine and allow to heat through for 2 minutes. 5. 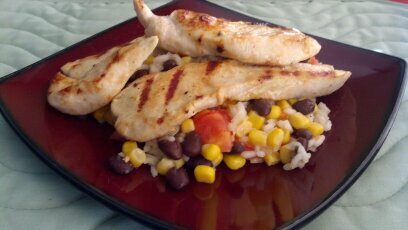 Serve the chicken over a bed of rice and ENJOY! On a cold, rainy, winter's night, a warm and hearty dinner is required. 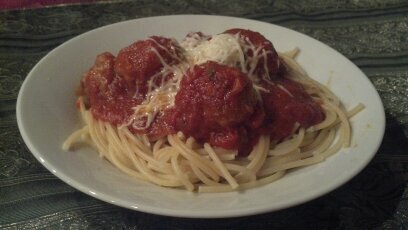 While soup might be the stereotypical meal, in our household, we turn to meatballs, at least tonight. This recipe differs from my other recipe (Entertaining Meatballs) in the use of pork. These are large meatballs, but you can certainately make the smaller if you desire. I have also given you two options for cooking depending on how you plan to serve them. For spaghetti and meatballs, I would use Method 1. However, these are also great as Swedish or Barbecue Meatballs; for these recipes, use Method 2. These are my husband's favorite for meatball sandwiches. These come out light and fluffy yet hearty. 1. Using a sharp bread knife, remove the crust from the 5 inch piece of french bread. Discard the crust. Cut the bread into 1 inch cubes. Place in a bowl and cover with 1 cup milk. Set aside for 5 minutes. 2. In a separate bowl, combine all ingredients, including the milk soaked bread. Using your hands, thoroughly combine the ingredients. You do not want to over-mix, but you want to make sure everything is mixed. 3. Pinch of sections of the mixture and roll into 1.5 inch diameter balls. 4. Cook the meatballs by your choice of method (see below). Place the uncooked meatballs in a large pot filled with a jar of your favorite marinara (homemade if you have it on hand). Cook over medium heat for 30 minutes, gently stirring periodically. Spoon over cooked pasta and enjoy! Place the uncooked meatballs on a large baking sheet lined with foil. Leave space between each ball to allow for even cooking and browning. Bake at 425 degrees for 30 minutes. Place in your desired sauce and serve. I love lettuce wraps and wanted to try something new with my typical recipe, so I added the rice paper. I am personally not a fan of the chewy rice paper wrapper texture, so I have decided to baking the rolls in order achieve a crisp texture. By baking the rolls, you are also making them easier to serve for cocktail parties and football gatherings. A great thing about this recipe is that you can make the filling a day in advance and then just roll and bake prior to eating. For those of your concerned about calories and carbs, this is a great option. The result is a very filling dish highlighted by a vinegary sauce to lighten the dish even more. If you do not want to use rice paper wrappers at all, simple serve the filling directly on the lettuce leaves after cooking (this is how I first made the recipe). 1. Start by making the special sauce. Combine the hot water and sugar in a bowl and whisk to dissolve. When the sugar is completely dissolved, add the remaining ingredients, whisking to combine. Cover and store in the refrigerator until ready to serve. 2. In a large skillet, heat 2 Tablespoons of oil over medium high heat. 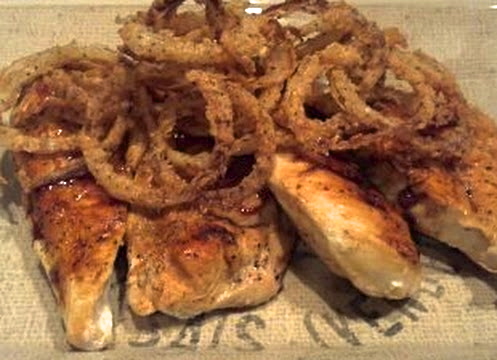 When the oil is hot (rippling) add the boneless chicken breasts...DO NOT MOVE THEM! Allow the chicken to cook for 5-6 minutes and then turn. Allow to cook on the other side. If you have thick pieces of chicken, you may need to repeat the turning process again with a total cooking time of 13-15 minutes. You should get a good brown crust. Remove chicken from the pan (also remove the pan from heat) and allow to rest until cool enough to handle. Dice into small pieces, roughly the same size as the mushrooms. 3. While the chicken is cooling, combine the ingredients for the stir fry sauce and set aside. 5. When the filling has cooled, you may begin the assembly of the rolls. 6. Prepare a glass baking dish by coating with a thin layer or canola oil. You DO NOT want a lot of oil, just enough to create a barrier while baking. 7. To assemble the rolls, you will need a large dish filled with hot tap water, rice paper wrappers, cooled filling, and a plate. To fill each roll, begin by soaking the rice paper wrapper in the hot water for 25-30 seconds until softened....do not let them sit too long (TRUST ME!). Place the wrapper on a plate. With the wrapper laying flat, scoop 2 Tablespoons of the prepared filling into the center of the wrapper. You are going to fold them up burrito style; fold the sides in to meet in the middle and then roll tightly. Set the filled rolls on the prepared baking dish. DO NOT ALLOW THE ROLLS TO TOUCH ON THE BAKING DISH! If they touch at any time during baking, they will attach to each other and break apart when separated. 8. Once you have all the rolls prepared, coat each roll with a light drizzle of canola oil and gently rub to coat. 9. Bake the rolls in a preheated 425 degree oven for 20-25 minutes or until lightly golden and crispy. As baking times will vary, keep an eye on your oven! 10. 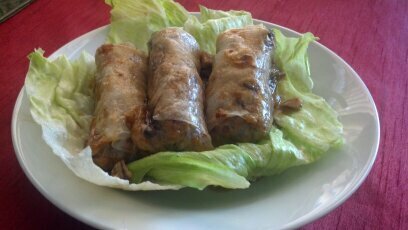 Remove from the oven and serve with lettuce leaves, used to wrap around the hot rolls, and drizzled with the special sauce. Baked chicken is a staple in my household. When most people hear that we eat baked chicken, their first response usually has something to do with "How do you keep it from drying out?" While this recipe is not directed completely at this question, it is a solution. The great thing about this recipe is that you can brine it all day, if you want, and the chicken will come out of the oven flavorful to the bone and juicy! No more dried out chicken here! In a large bowl, combine the water and seasoning mix. 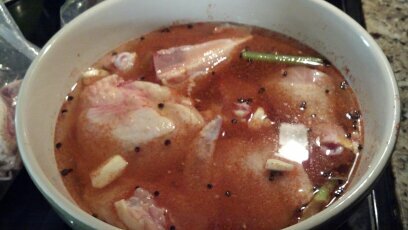 Place the chicken pieces in the brining mixture making sure they are submerged. I like to cut the breast pieces in half so they are more similar in size to the thighs. This just makes it easier to time the cooking later on. Cover the bowl with plastic wrap and allow to sit in the refrigerator for at least 2 hours. Preheat your oven to 375 degrees. 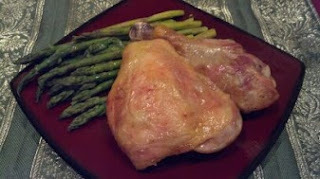 While the oven heats, remove your brining chicken from the refrigerator and arrange on a broiling pan, skin side up. Lightly pat excess moisture off the top of the chicken with a paper towel. However, do not rub the chicken! You do not want to remove the seasoning from the chicken. Bake the chicken for 1 hour 15 minutes. The skin should be deeply golden and crisp and all juices should run clear from the meat. My husband and I love a really good Spinach Artichoke Dip, however, many of the ones out there use either jarred Alfredo or mayonnaise in the preparation. While there is nothing wrong with using these ingredients, I prefer a more humble dish, not to mention one lighter on calories than its' counterparts. This recipe is also great for mini-slow cookers as you can set it on low and keep it hot all throughout the party; you would just need to expect about a hour to heat it through before serving. 1. Combine all ingredients, minus 1/2 cup mozzarella cheese, in a large mixing bowl. Stir to combine. 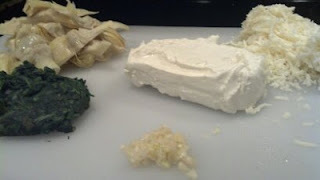 You do not need to completely break apart all of the Neufchatel cheese as it will melt into the other ingredients as long as you have cubed it small enough. 2. Pour the mixture into a 9x9 baking dish. You don't want the dip to deep or you will have to increase the baking time and you will not have as much of the top crust for enjoying. 3. Sprinkle the reserved 1/2 cup mozzarella cheese over the top of the dip. 4. Place in the preheated 375 degree oven and bake for 30 minutes or until bubbly and golden on top. If after 30 minutes the top is not as brown as you would like, simply place it under the broiler for 1-2 minutes, but watch it closely! 5. Serve hot with pita crisps, bread points, or tortilla chips.